April 16 – John Delaney’s colourful and controversial career as an influential voice in European football administration is under severe threat after the Football Association of Ireland (FAI) announced he had offered to step aside as its executive vice-president with immediate effect amid increasing criticism over an authorised loan he provided in 2017 that called into question serious governance issues. Last month Delaney, a member of UEFA’s executive committee, dramatically quit as the FAI’s chief executive just days before he appeared in front of a parliamentary committee to be quizzed about the €100,000 personal loan and instead moved straight into a face-saving position as executive vice-president with responsibility for all FIFA and UEFA matters. But with half of the federation’s €2.7 million state funding suspended in the wake of the storm, Delaney’s long career in senior administration is hanging by thread without him having hardly had time to take up his newly created job. “John Delaney has offered to voluntarily step aside from carrying out his role as Executive Vice-President with immediate effect pending the completion of an independent investigation by the association into issues of concern to the board,” the FAI said in a statement. The short-term loan, which the FAI said it needed to relieve cash-flow issues in 2017 and avoid breaking its €1.5 million overdraft limit, has led to investigations into the association’s finances and corporate governance. Two other long-standing members of the 11-strong FAI board – Honorary Secretary Michael Cody and Honorary Treasurer Eddie Murray – also resigned voluntarily on Monday. Irish Prime Minister Leo Varadkar said on Friday that he did not think anyone would be satisfied by Delaney’s appearance before government officials, where, aside from reading an opening statement, he remained silent through most of the five-hour hearing. Delaney told the committee he offered the loan as the FAI potentially only had a few hours to resolve its cash-flow issues. But following the meeting, two of the FAI’s main sponsors, sportswear manufacturer New Balance and mobile phone operator Three, called on the FAI to quickly implement recommendations from reports it has commissioned into its corporate governance. 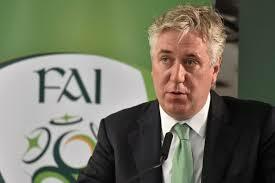 Supporters and players have also turned against Delaney, who had run the FAI since 2004. The Sunday Times newspaper, which first reported details of the loan, increased the pressure on Delaney in its most recent edition by claiming he spent almost €40,000 on his work credit card in the space of six months shortly before he personally bailed out his federation. The payments allegedly included duty-free purchases, meals in Delaney’s local pub and cash withdrawals of more than €6,000. The latest developments threaten to seriously undermine Delaney’s position at the top table of UEFA at the worst possible time. Only last week, UEFA lost one of its most powerful figures when Reinhard Grindel, who was also a FIFA Council member, resigned after being embroiled in a domestic scandal in Germany. UEFA said they were “aware” of Delaney’s situation but would make no further comment on his executive committee position which runs until 2021. It is not the first time 51-year-old Delaney, who is no stranger to headlines, has been embroiled in controversy. Back in 2016, he quit as vice‑president at the Olympic Council of Ireland but denied any involvement in a ticketing scandal that rocked the organisation during the Rio Olympic Games. The previous year he admitted the Irish federation had accepted a reported €5 million loan from FIFA, instigated by then president Sepp Blatter, after the Republic controversially lost a World Cup qualifier to France courtesy of Thierry Henry’s infamous handball. Irish reports at the time said the money helped to pay the FAI’s bill for redeveloping the national stadium and that, recorded in the FAI’s accounts as an interest-free loan, it was later written off, as agreed, when Ireland failed to qualify for the 2014 World Cup in Brazil.